“May I have a taste?” the letter stated. WCCO​ reports a woman in Minnesota allegedly sent a family threatening notes about their children describing how she wanted to taste them. Police said the woman, identified as ​Carrie Pernula​, was upset because the children were making too much noise. The family, who live in Champlin, reportedly got the first note Sept. 27. 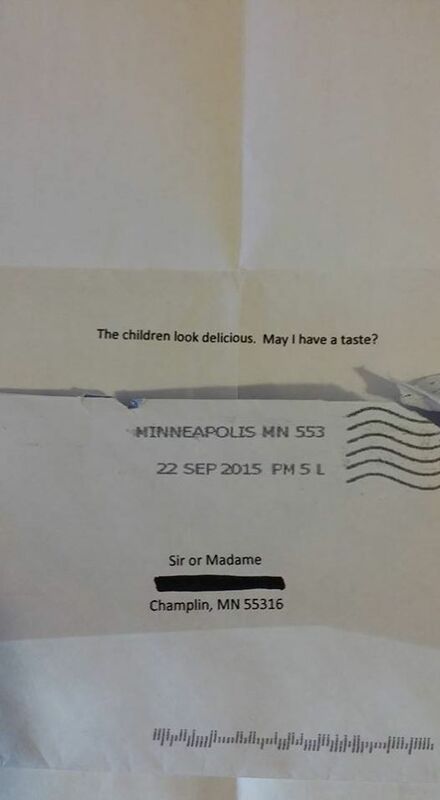 The letter stated, “​The children look delicious. May I have a taste?” Two elementary school children live in the home with their parents. The parents posted a photo of the disturbing message to the Facebook page of a local community group, along with their response.